Hi folks! Welcome to Kotlin Thursdays. Last week, we examined classes, types, generic functions & parameters as well as covariance & contravariance in Kotlin. Folks told me there weren’t enough sloth facts, and as such, I will do my best to rectify this! Let’s continue with our sloth and panda crews and write more functions with Kotlin Generics. Because Kotlin happens to be a functional language, Kotlin has a lot of really powerful characteristics functional purists might consider as pillars for functional programming. One of these pillars, we’re only going to concern ourselves with the first Kotlin has first class citizens, which means that Kotlin may take functions as parameters. These are known as higher-order functions. What does it mean for a function to be a first-class citizen? All this means is that you are able to pass in a function argument as a parameter in a function. How meta! This is a feature that is also comparable to Ruby, which facilitates higher order functions. The most common usage of higher order functions involves passing a block to a method, which is an extremely popular Ruby method. Ruby allows you to inject different blocks into functions using yield, which involves passing a block to a method. With yield, the block is no longer a parameter to the method. The block is implicitly passed to the method. Yield makes executing the block feel like a method invocation within the method invocation rather than using an explicit call. In (A, B) → C, this pattern indicates that a function expects a function parameter that takes 2 parameters type A and type B, and returns an output of type C.
In A. (B) → C, this pattern indicates that a function expects a function parameter that is an extension function of type A and that extension function takes a single parameter B that returns an output of type C.
In the scientific community, 6 species of sloths recognized. 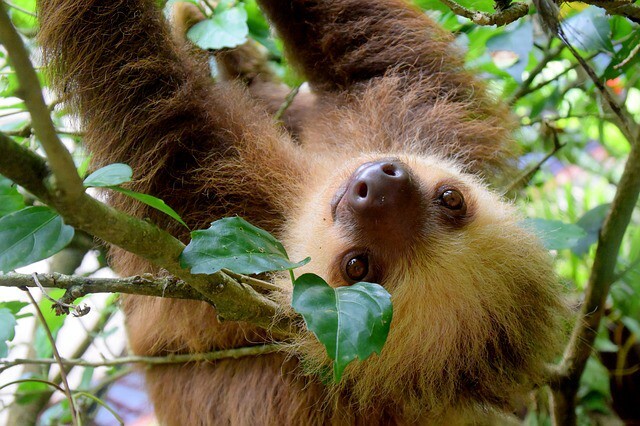 In Costa Rica, there are only 2 types of sloths; the brown-throated three-toed sloth and Hoffmann’s two-toed sloth. 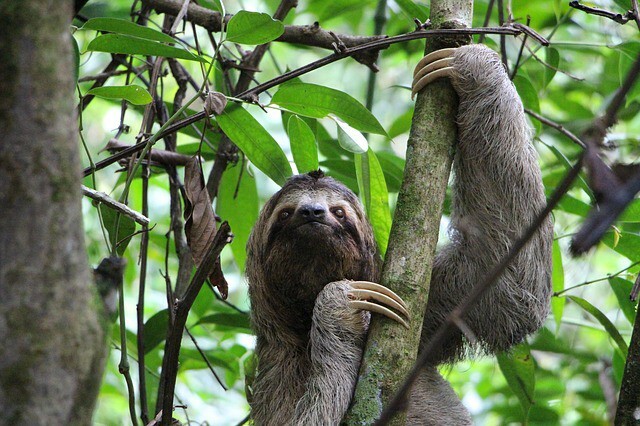 Black eye patches and “smiling” mouths distinguish Costa Rica’s docile three-toed sloths, while the larger two-toed variety have white-ringed faces, brown snouts and shaggy coat1. They actually have quite a bit in common with each other with subtle differences: for example, they both relieve themselves once a week and ARE ABLE TO EXPEL AS MUCH AS 1/3 OF THEIR BODY WEIGHT AT A TIME. Despite their slow nature and digestive system, they can also swim in a manner that is very similar to the breaststroke. We’ve written a higher order function that takes an action function which takes no parameters and gives no outputs, which is of the type Unit. Let’s look at another example: All mammals (including giraffes) have 7 cervical vertebrae except for manatees who have 6 and sloths, who have 10. They put yogis to shame with their incredible flexibility! Let’s write some functions comparing these animals by adding a manatee class and switching our Mammal class from open to sealed. Sealed classes are pretty cool, and you can learn more about it from Patrick Cousins’ KotlinConf talk from last year. This way, we can write when statements in Kotlin, which will only consider these classes under the sealed class as all the exhaustive existing types. KFunction1 happens to be a covariant/contravariance generic that represents a function with introspection capabilities! You can reference these functions with a ::, which in Kotlin is about meta-programming, including method references, property references and class literals. Sometimes you will see :: without a class in the front, indicating that a method is being call from within the class you’re in, but otherwise, the class you’re referencing a method from sits on the left. Kotlin is smart enough to detect parameters as needed — but you might want to read into it a little more and experiment yourself! Contravariance on P1 introduced by in modifier — Any KFunction1<PSuper, R> will be a subtype of KFunction1<P, R> if PSuper is a supertype of P.
Covariance on R introduced by out modifier — Any KFunction1<P, RSub> will be a subtype of KFunction1<P, R> if RSub is a subtype of R.
Therefore you will be able to assign KFunction1<PSuper, RSub> to a variable of type KFunction1<P, R>. You’ll notice that we can feed in vertebraeCount() and knownSpeciesCount(), but what if we tried to feed in an endangered function named isEndangered()? is Manatee -> false // upgraded to "threatened"
If we tried to feed this function in to our checkMammalFacts function, the compiler would complain, because it expected the type KFunction1<Mammal, Int> and we’re feeding in KFunction1<Mammal, Boolean>. Well, I hope you enjoyed these sloth facts and learned a little bit about higher-order functions in Kotlin! Next week, FOR SURE, we’ll go over reified generics in Kotlin. Till next time!